Despite the hype, surrounding the November 1998 High Definition TV launch, when more than forty Broadcast TV stations began to operate a second, Digital TV transmitter on UHF, Cable TV systems should not worry about subscribers complaints that HDTV is not carried on cable. According to the head of the consumer Electronics Manufacturers Associations, the member compa-nies sold 13,176 HDTV sets in the fourth quarter of 1998. Compare this number with the 27 million conventional (analog) television sets sold in 1998. Does it mean that CATV systems can stay on the sideline and wait until the price of the average HDTV set drops from $7,000 to $1,000, so the transition to DTV can pick-up speed? The answer is: Definitely not! Every month dozens of new DTV carriers appear in the 470 to 800 MHz spectrum, and ultimately 1,500 DTV stations must be squeezed into the UHF band. 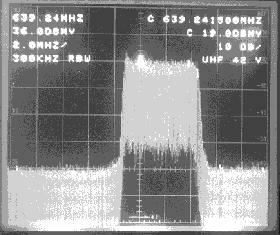 Observe the two Polaroid pictures taken from the screen of the spectrum analyzer, demonstrating why CATV systems should start upgrading their UHF antenna systems now, rather than waiting until disaster strikes. The Channel 65 video carrier is in the center of the screen. Observe the high amplitude DTV spectrum below the NTSC channel. This is a "free-standing" DTV carrier. No analog adjacent carriers above or below. 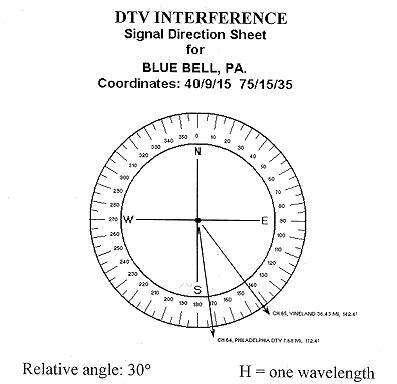 Despite the fact that the FCC's DTV frequency allocation was prepared with great care, more and more CATV systems are exposed to DTV adjacent channel interference problems while carrying NTSC (analog) UHF stations. 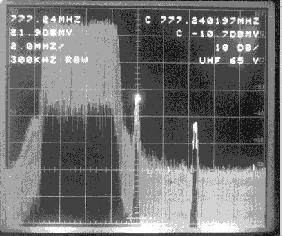 The DTV transmission's spectral power is evenly spread out across 5.38 MHz, as shown on the figure below. Consequently, the limited sensitivity of the UHF signal processor provides very little protection against the adjacent powerful spectrum. Installing a UHF trap? The narrow bandwidth of the trap can cut out only a very limited segment of the 5.38 MHz wide interference signal. Applying a bandpass filter: Bandpass filers in the UHF frequency range are prone to inefficien-cies. The application would not solve the interference problem either. The DTV spectrum also exhibits a lower and upper sideband splatter, which, passing through the signal processor's IF amplifier, will create random noise or snow in the NTSC picture. 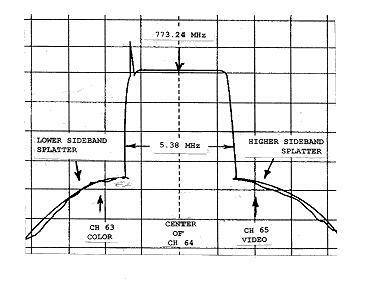 Should the amplitude of the sideband splatter exceed a critical threshold,the picture impairment may appear in the form of impulse noise. The white (black) streaks show up randomly, just like poor quality satellite pictures. It has been established that traps and bandpass filters cannot cure the adjacent channel DTV interference. Even high-priced and super-tuner UHF signal processors lack the necessary selectivity. A combination of all three? It's good business for the equipment supplier. The age of DTV interference is here. However, there is no assurance that it will hit only bon one channel. It is the CATV system's best interest to seek professional help before DTV interference strikes. * This is a proprietary product of Biro Engineering.